Louis Dairymple. “School Begins.” Puck. (Keppler & Schwarzmann, New York: 1899). Two cartoons from different magazines published in New York, New York in 1899 took different stances on U.S. expansionism. A piece by Victor Gillam from Judge named “A Lesson for Anti-Expansionists” sends a pro-expansion message, while Louis Dairymple’s “School Begins” from Puck takes a decidedly negative stance. Both cartoons come in the year that the United States routed Spain in a ‘splendid little war’, which left the United States with a number of colonies in the Caribbean and Pacific as well as an undeniable place among the world powers. There were no longer any doubts that the United States was taking its imperialist policies beyond the western frontier and across the waters, as it had in annexing Hawaii in 1898. Some, like Gillam supported U.S. foreign policy, while others, like Dairymple saw imperialism’s unpleasant repercussions. 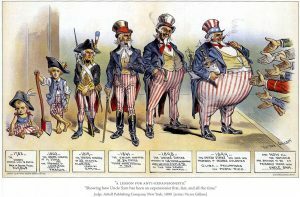 So, how do political cartoons from the era of US imperialism in the Gilded Age show positive and negative views of expansionism? In order to unpack the symbolism and meaning of each illustration I will compare the depiction of the shared cenral figure, Uncle Sam. Uncle Sam represents the U.S. in both cartoons, but with different objectives. He is dressed almost exactly the same in each, but his weight, how he’s interacting with other characters, and the objects he carries differentiate him and therefore the respective artist’s intentions. Victor Gillam. “A Lesson for Anti-Expansionists.” Judge. (Arkell Publishing Company, New York: 1899). The Uncle Sam from the Judge is depicted chronologically, showing the maturation and then growth of the U.S. with his weight, which coincides with the increasing square mileage of the nation and its territories. The chronology begins in 1783, the year in which the Treaty of Paris ended the Revolutionary War, granting the U.S. its sovereignty. At this point, Uncle Sam is shown as a helpless, but optimistic looking toddler representing 349,845 square miles in 13 states. From there, Uncle Sam grows into a young boy with an axe in 1803, a soldier with a musket in 1819, and a middle-aged man in 1861 with a top hat and goatee. In 1898 Uncle Sam is looking more corpulent, representing 48 states and territories, including Hawaii, totaling roughly 3,601,270 square miles. Finally, in 1899, the year in which the U.S. gained Cuba, the Philippines, Puerto Rico, Guam and Samoa from Spain after a quick and decisive war, Uncle Sam appears absolutely bloated. In this depiction Victor Gillam is clearly showing that U.S. expansionism has merely been a process of maturation, from a small toddler to a stout, confident-looking old man, “showing how Uncle Sam has been an expansionist first, last, and all the time,” reads the caption. This Uncle Sam surely represents all the excesses of successful capitalism. Nothing in this cartoon points to the negative side effects of the U.S.’s rampant expansionism, showing only how the U.S. has led a healthy, bountiful life. Dairymple’s 1899 depiction of Uncle Sam is quite different, far from overweight; this man is gaunt and towers menacingly over his class. He is undoubtedly portraying Uncle Sam and U.S. expansionism negatively. However, an analysis of Uncle Sam’s relationship with the other characters in this cartoon is more relevant to determining the artist’s message. Uncle Sam’s interactions with other characters also provide evidence of support as well as condemnation of U.S. expansionism in Gilded Age periodicals. 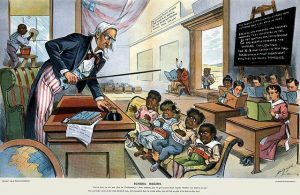 Dairymple’s cartoon is a depiction of a classroom in which the states and territories are represented as children and Uncle Sam is the draconian-looking teacher, peering down at his pupils through a pair of spectacles that give him a more scholarly appearance. Uncle Sam’s posture and age is juxtaposed with the youth of his subjects, which indicates a paternalistic and authoritarian relationship. This is especially meaningful when considering who’s in the first row. Four darkly colored, wild-looking children representing the Philippines, Hawaii, Puerto Rico and Cuba sit stubbornly, scornfully or fearfully on their bench as the caption reads, “Now, children, you’ve got to learn these lessons whether you want to or not! But just take a look at the class ahead of you, and remember that, in a little while, you will feel as glad to be here as they are!” The class ahead refers to the children labeled with states who sit obediently going about their studies. The four children at the front represent an average depiction of the heathen, uncivilized races that the U.S. encountered in its imperialistic ventures. This motif and the associated paternalistic themes are pervasive throughout the Gilded Age and well into the 20th Century. The artist seems to be questioning the U.S.’s ability to colonize these people through a subtle message that appears on the blackboard, which explains that while “consent to be governed” is a nice sentiment, a people must be caught up by a benevolent teacher before they can be allowed to make an informed decision on their own sovereignty. The Platt Amendment later confirmed this impression in 1903, when it denied Cuba true sovereignty for decades. This artist’s satire matches that of Rudyard Kipling who wrote “The White Man’s Burden” in 1899, which directly opposed U.S. hegemony in the Philippines. The artist understood that U.S. imperialism unfairly treated other cultures. As a lingering example of this, a Native American sits by the door alone trying to read a book, which is upside-down. This perfectly illustrates how the Native American tribes faced relocation to isolated, desolate reservations and then disaffection. A Chinese boy waits at the door, obvious foreshadowing by Dairymple, which came to pass a year later when the U.S. became involved in the international effort to stop the Boxer Rebellion and force open the coveted Chinese markets. While “School Begins” work was completely anti-expansionary, “A Lesson for Anti-Expansionists” seems to be the exact opposite. Providing a pro-imperialism argument, in this case, is impossible to do when taking into account the American treatment of the subjugated people. There is no racial component in Gillam’s work apart from the hand marked China, which does happen to be at the bottom of the hands though this does not necessarily mean anything because England, the fattest and presumably the most successful of the hands, is third from the bottom. The crux of Gillam’s pro-expansion argument lies in the caption below the outstretched hands, “now all the nations are anxious to be on friendly terms with Uncle Sam.” Now it is clear that Gillam is suggesting that U.S. imperialism has gained the country respect, or at the very least, fear, from the other world powers. Expansion has been the U.S.’s answer to posturing itself strongly and successfully on the world stage. Of course, the U.S. would not be a credible power if it weren’t for the powerful military it wielded, which is represented by the battleship under the 1899 Uncle Sam’s arm as he contemplates the groveling hands. The objects Uncle Sam clutches, namely the battleship, cigars and the big stick are highly symbolic and aid the artists’ respective view of expansionism. Gillam, with his positive interpretation of American imperialism has the 1899 Uncle Sam carrying a battleship, representing naval power, which is a precursor for imperialism. Naval powers like England and Spain capitalized on the ability to secure trade routes and deploy troops and supplies across the oceans with their vast fleets. The U.S. proved its naval supremacy in the Spanish American War at Manila Bay and Santiago, Cuba where it decimated the outdated Spanish Pacific and Atlantic fleets. The battleship Uncle Sam holds is painted white, which was the Navy’s peacetime color in this era, but it invariably evokes the Great White Fleet which sailed around the world in 1907-09, solidifying America’s maritime supremacy and thus its position as a world power. The cigars that the 1898 and 1899 Uncle Sams are smoking symbolize imported tobacco products from newly acquired tobacco and cigar producing territories; an admittedly small element, but important nonetheless as it reveals the importance of business, specifically through trade, when it comes to imperialism. “1899 – the U.S. has come into possession of VALUABLE COLONIES,” reads the caption with an emphasis on the capitalized words. In “School Begins” Uncle Sam wields a switch and has a book on his desk about self-governance. The book is clearly ironic because the U.S. isn’t actually promoting self-governance when it holds colonies against their will without any representation in the national government or any kind of self-determination for that matter. The switch wielded by Uncle Sam in “School Begins” merely symbolized the violent nature of American expansion, that is, until 1900 when Teddy Roosevelt first said “speak softly and carry a big stick and you will go far.” The switch now can be interpreted as the ‘big stick’, which became highly symbolic of American imperialism, especially after the Philippine Insurrection and the American forays into Latin America after the Roosevelt Corollary to the Monroe Doctrine was adopted. This is another example of how a political cartoon can gain new meaning long after it has been published. In summary, both cartoons depicted objects that contained powerful symbolism, like the battleship, the cigars, the book, or the switch. The objects are important tools for furthering the artist’s interpretation of U.S. expansionism. These objects have taken on greater symbolism since the cartoon was published. Uncle Sam represents the United States in both cartoons, but with different objectives. He is dressed almost exactly the same in each, but his weight, how he’s interacting with other characters, and the objects he carries differentiate him and therefore the respective artist’s intentions. The corpulence of Gillam’s 1899 Uncle Sam is a testament to the success of capitalism through imperialist policies, while the gaunt, towering figure of Dairymple’s 1899 Uncle Sam appears much more menacing to the cowering, defiant children that represent newly acquired territories. Gillam’s 1899 Uncle Sam is portrayed as a desirable ally to other world powers due to his naval prowess and imperial expansions, while Dairymple’s seeks to ironically teach the heathen races about self-governance. The accessories of Gillam’s Uncle Sam symbolize American military and economic power. The violent side of imperialism is alluded to by Uncle Sam’s ‘big stick’ in “School Begins.” Both authors used elements that gained credence and symbolism long after the works were published. Dairymple’s blackboard satire became U.S. policy when the Platt Amendment was signed in 1903 and Gillam’s white battleship’s symbolism grew after the Great White Fleet completed its world tour in 1909. These examples prove that political cartoons can be used to understand forthcoming historical events and not just immediate or previous ones. The foreshadowing and subtler features of these cartoons were justified time and again shortly after they were published. This makes these cartoons, both from 1899 relevant to the entire Gilded Age as it allows us to understand how Americans made arguments on both sides of the expansionism debate. Gillam’s pro-expansion piece glossing over the negative implications of imperialism in order to justify a policy that put profit and power ahead of people is a perfect parallel to the Gilded Age. Gilded, after all, refers to the gold covering or pleasant farce that masked the plight of the working class and minorities during this era. Mark Twain and Charles Dudley Warner coined the term in 1873, decades before these cartoons appeared in their respective magazines or when historians agree the Gilded Age actually ended. In order to fully appreciate American Gilded Age society, one must consider society holistically. This study of two opposing political cartoons has revealed how society was torn. History proves that the United States has never truly been united in its endeavors; during the Gilded Age, issues like suffrage, labor rights, regulations, and equality divided the nation just as much as debates concerning expansionism. Victor Gillam. “A Lesson for Anti-Expansionists” Judge. (Arkell Publishing Company, New York: 1899). Louis Dairymple. “School Begins” Puck. (Keppler & Schwarzmann, New York: 1899).